Kalvin Phillips, set to carry on in midfield for Leeds United against Swansea. They may have only won two of their last seven league matches to put their promotion bid into doubt, but the spirit of the Leeds United players remains intact going on the number of late goals they continue to score. The latest, from Kalvin Phillips, came in the 101st minute of their huge clash at Middlesbrough and earned possibly the most valuable draw they will achieve this season. 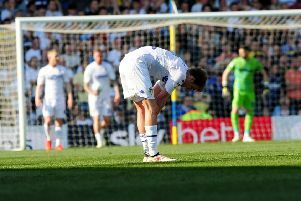 Defeat would have left them just four points in front of Boro and West Brom, who both have a game in hand, and it would have added fuel to the fire that Leeds were about to throw it all away. But the never say die spirit that Marcelo Bielsa has installed to this United team stood them in good stead again and they have now earned eight points with goals in second half injury-time of matches this season – they would be sixth and not second in the table if these goals were taken away. Now the trick is to get the earlier part of matches right, beginning with tonight’s home game with Swansea. To say they could do with a win is a real understatement. They need to send out a message that promotion is still on the agenda at Elland Road and while the fighting draw at Middlesbrough was great in the circumstances only a convincing victory will do this time. Head coach Bielsa faces a few selection dilemmas ahead of the game and know he must get it right. He had a stronger squad at his disposal for last Saturday’s game with £7 million striker Patrick Bamford starting his first league game and loan player Izzy Brown finally fit enough to make his first appearance on the bench, even if he was an unused substitute. But he has lost at least one of the players on duty at the Riverside with no risks taken on young winger Jack Clarke, who had to go to hospital after feeling ill while on the bench and having to receive oxygen from paramedics. The brilliant teenager, who is being watched by Premiership clubs, was not detained in hospital, but when he will return to play is unclear. Bielsa also revealed after the match that left-back Barry Douglas was also injured so he looks unlikely to play tonight. Midfielder Adam Forshaw is also still out with a knee injury so goal hero against Middlesbrough Phillips will carry on in midfield. Bielsa, meanwhile, gave a vote of confidence this week to right-back Luke Ayling whose form has dipped in recent weeks and has led to some supporters hoping that Kippax teenager Jamie Shackleton would be included at his expense. Swansea have their own dilemma at whether to play Leeds-born striker Oli McBurnie, who has been struggling with injury, and winger Daniel James, who has been left disappointed that his proposed move to Leeds fell through on transfer deadline day. Swansea manager Graham Potter insisted he had no concerns about James’ ability to handle a visit to Elland Road. He said: “Players like that, they respond to it. Certainly the ones who have the possibility to play at a good level, which Dan has.